After servicing for over nine years in the field of app developments, Moon Technolabs is now ready with their Node.js developmental services. CHICAGO - Feb. 21, 2019 - PRLog -- Moon Technolabs is a well-known name in IT industry. With the motto of optimization to ranking, the company has been working relentlessly over 9+ years round the clock to innovative the world of app development. Now the company is all set to emerge as a node.js development company catering a team of handpicked specialists for levelling to their uncompromised standards. Moon Technolabs, serving the IT industry for over a decade has hard earned the fame of topmost mobile app Development Company and also has been a forerunner in the field of web development. And now their decade old experience with a team of freshly handpicked specialists are ready to embrace node.js and emerge as node.js development company, a premiere one per say. 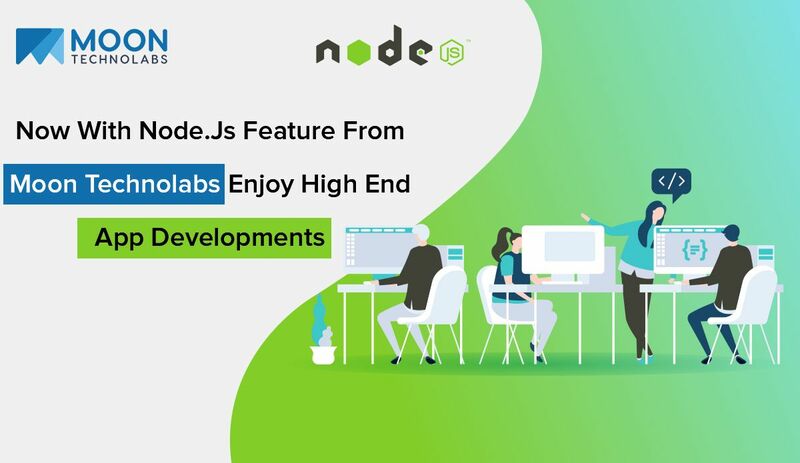 Their node.js development services have been developed keeping in mind the need of hour, client preferences and all these in a transparent business environment. Their intriguing module for node.js development encompasses some prime features like node.js customization as per client's preferences, providing node.js real time statistics, node.js mobile app services, integration solutions, large web application developments, plug in developments, backend dashboard developments, node.js API development , node.js UX/UI developments, Ecommerce shopping carts developments, AJAX development, portal development, content management tool development and many more. Their expertise in the field of node.js lies at end to end node.js development, app developed and designed with cutting edge modern day tools but focusing solely on client's business structure, accommodating all needs of clients as far as possible, maximising ROI, protecting and securing all secured assets and client data and stress free extra dominance for giving a mileage to business. During the launch event the CEO, Jayanti Katariya was asked about node.js? "At Moon Technolabs we understand the importance of innovation in field of technology. Nowadays the demand for apps with online/offline video streaming, single page based applications are increasing. Thus we have designed our innovative module that encompasses from customized app development to ecommerce shopping carts to portal developments as well as content management tools. And to emerge as a premier Node.js development company we have prepared our dextrous team by recruiting some handpicked talents from all across as we never compromise with our quality" was the courteous reply from the CEO. Moon Technolabs have always been a forerunner when it comes for mobile and web app development. They have always catered positive response from clients all across the globe. Their highly skilled and extremely professional R&D teams are always keen to take up challenging situations and push their limits to come up with radical and innovative ideas. This knack for innovation and quality has landed them with some awards like the 8th GESIA Diamond Class Award for being the Best mobile development company in 2015. Along with innovation and uncompromised quality, customer satisfaction has always been another prior area for Moon Technolabs. Thus their extremely agile customer assistance is team works round the clock for quenching all queries and sorting all issues that customers face.